Mercury rules both these signs, but in very different ways. Gemini likes it light, while Virgo can become obsessed with one detail. In order to avoid driving each other crazy, these two must make the most of their shared strength—communication. Sun in Gemini likes to keep things moving. His purpose is to continually learn new things, and that means he doesn’t linger on one subject, project or conversation for too long. It can be challenging for his partner to keep Sun in Gemini’s attention for extended periods of time. This is why it’s essential that his lover is as mentally quick and in love with conversation as he is. Gemini can be a flirt, but a partner who challenges him with new ideas will keep him coming home. Moon in Virgo needs to fix things. Some might say that she needs to find things to be unhappy about, and the Shadow side of this Moon can be a chronic worrier. But her energy is based on the desire for improvement, and this extends to her partner and relationship. A content Moon in Virgo will support her partner with practical advice, while perfecting and polishing her relationship. Her partner must be on board with her desire for refinement, while sharing her need to discuss every detail of the process. Moon in Virgo’s nitpicking will drive Gemini crazy, and Sun in Gemini’s fast-forward lifestyle will make Virgo panic. Each will heighten the other’s anxiety as they bring out the extreme versions of their signs. Initially, they’ll be drawn by each other’s delight in conversation. But eventually, Moon in Virgo will collapse into a ball of worry while Sun in Gemini flees. Communication is the bridge between these two. 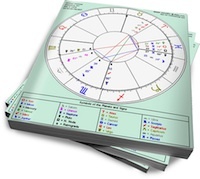 Gemini can move Virgo along when she gets stuck on one topic, and Virgo can anchor Gemini when he spins out of control with multiple projects. They’ll just have to accept that they’re speaking the same language in slightly different dialects. Thanks Nadia! I’ve been waiting for this combination. I’m a Gemini sun, and my first love, a Virgo moon. He’s also a Gemini Sun, and I’m a Scorpio moon. We have an on again off again relationship over decades. No one else gets us as we do each other – we feel like we are at home together – but we always end up with someone else due to misunderstandings, but then we reconnect again!. Any hope we’ll finally get it right and grow old together? I’ve removed all but the most recent comment, River. As a Virgo moon “Some might say that she needs to find things to be unhappy about, and the Shadow side of this Moon can be a chronic worrier”….. yep! How do you turn this over analytical brain off? I’ve only learned meditation to be the best way, but that only lasts a short period of time. Drugs and alcohol can wreak havoc on my body 🙁 I’ve been taking the Landmark Forum courses. They help. Anyway, never been with a Gemini Sun, but I have heard the “other twin” can get quite nasty. I’m a Gemini sun and virgo moon. I think it’s super accurate. For so long my control freak side makes sense…. if it’s hard for me to deal w my own self, it only works if it comes together.